The TetherBoost Pro conditions the line and regulates the power from DSLR/Digital Backs to the computer, eliminating these limitations and allowing your tethered connection to operate up to full USB 3.0 speeds for tethering connections from 15 to 65 feet without any loss in signal. The TetherBoost Pro also features the TrueConnect LED indicator which ensures signal connectivity between a photographer’s DSLR, Mirrorless or Digital Back camera and a computer. The TetherBoost Pro can be used with or without external power and will facilitate producing a reliable connection either way. However, adding power to the line will reduce the customary drain on camera and computer batteries. 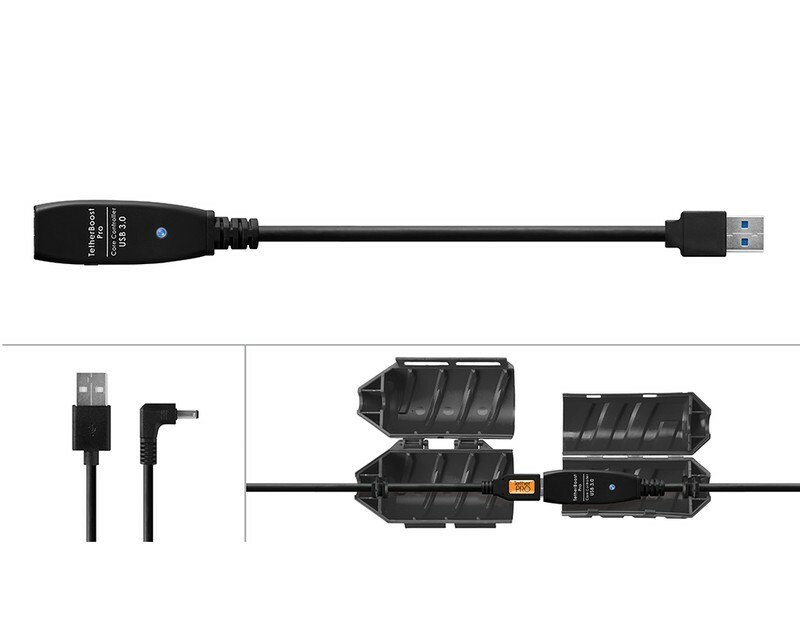 The included USB-D/C cable is optional for adding a USB external battery pack or A/C power (sold separately). Power Note: Tethering connections rely on power from camera and/or computer to transfer images successfully. TetherBoost™ helps solve various connectivity issues that may occur. Read this helpful article to understand more: Why does my connection fail? *Please note the purchase of the TetherBoost Pro USB 3.0 Core Controller does not include an external battery pack or AC adapter. Please see the TetherTools Rock Solid External Power Bank and TetherBoost A/C Power Adapter if required.